Q: What enables end-users to operate in these environments where bandwidth is limited? A: The video and imagery dissemination technologies are designed to work with low bandwidth connections and to be resilient against high latency connections. The data flow is reduced to match the existing available bandwidth, and in some cases, less than the available bandwidth to leave capacity for other users in shared environments. For example, several users sharing a single TCP/IP radio connection. The dissemination technologies are designed to send only the amount of information in time and space required to deliver the information. Additionally, users can control the quality, and therefore the amount of data, that is transferred from the server to the client device to match the mission needs. Conserving bandwidth and battery power is critical for handheld solutions. In reverse, users are also able to capture important data in their environment using their handheld device and upload it to the enterprise network once bandwidth has been restored. Q: Can you describe briefly the Jagwire enterprise solution that Jagwire Mobile is derived from? A: Jagwire™ is a web-based software system that allows your organization to easily ingest, store, manage, discover, and deliver geospatial imagery, video and analyzed products—even on mobile devices and bandwidth-constrained networks. An entirely scalable system designed to provide rapid access to multi-source, multi-INT and multi-modal geospatial data, Jagwire shortens the time from collection to decision. Also, Jagwire reduces up-front implementation costs and timelines of custom development by combining the cost savings of a trusted and proven COTS solution, with the option to customize every component to an individual organization’s needs. To date, Jagwire users were using network connected desktop computers or laptops connected to a TCP/IP radio. Jagwire Mobile extends the supported client devices to iPhone and Android handhelds. 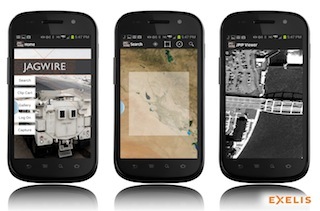 Jagwire Mobile users can their handhelds to view imagery and Full Motion Video stored in the enterprise. Additionally, users can use their handhelds to capture video and pictures to publish them to the enterprise. Q: Where will end-users access still imagery if there is limited internet connection? A: Sending information from the mobile device to the Enterprise/Cloud – The user can collect ground truth using the video and still imagery features of the handheld. The pictures and videos can be uploaded to the Enterprise/Cloud immediately if connected, or at a later time when a connection is available. Sending information from the Enterprise/Cloud to the mobile device – Exelis has implemented a cache on the mobile device that allows the user to continue viewing data that was previously viewed even if the connection is dropped and it will continue with new information if/when the connection is restored. Exelis is implementing a chip/clip cart functionality that would allow the users to preload images and videos to be viewed later in a disconnected state. Q: What type of data compression techniques are employed in Jagwire Mobile? A: For imagery, JPEG2000 and JPIP Streaming are employed in Jagwire Mobile, and MPEG for video. mobile version of Jagwire, and the other is a desktop view of the program in mode to track full-motion video. This entry was posted on Tuesday, June 11th, 2013 at 9:23 am. You can follow any responses to this entry through the RSS 2.0 feed. You can leave a response, or trackback from your own site. E3De is used for 3D LiDAR feature ettracxion. You can definitely visualize and edit the point cloud. When you extract the features, you can automatically extract power lines, buildings, and trees. You can then classify your buildings in ENVI to denote which buildings correspond to a specific class, etc.